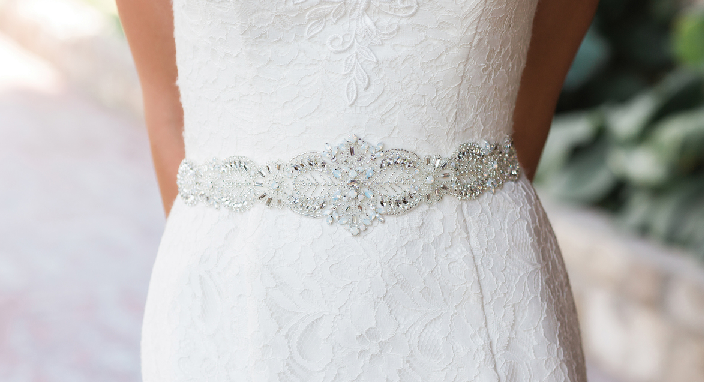 A beautiful belt or sash will add instant glamour and glitz to your wedding dress! What an elegant way to dress up your bridal ensemble. Bridal belts help to accentuate the waistline, creating a more glamorous look and sleek figure. We have a wide selection of wedding dress belts with sparkling crystals and rhinestones, pearls, brooches, lace and flower details so you can find the perfect belt to complement your gown. Featured here is one of our opal beaded belts by Envogue, Style BT1885. Pearl and Rhinestone Beaded Swirl Wedding Dress Sash Belt - sale! Elaborate Pearl and Crystal Beaded Wedding Dress Belt Sash - sale! U.S. Delivery time is usually 7-10 days. Need it faster? Call us at 502-835-4421.